CCD which is a part of India’s largest coffee conglomerate, Amalgamated Bean Coffee Trading Company Limited (ABCTCL), has more than 1500 coffee outlets across the country. With this partnership, MobiKwik is making their foray into offline payments market. Till now, Mobikwik offered online and mobile payment services for mobile recharges, DTH and utility bills and others. They also offered mobile wallet services that could be used to make purchases at hundreds of ecommerce websites in India. 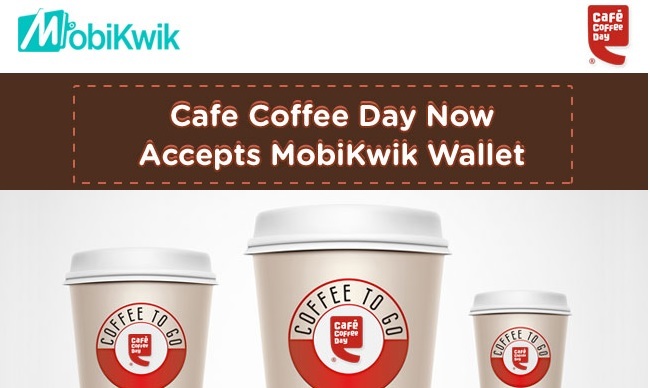 With this partnership, MobiKwik users will now be able to walk into their nearest CCD outlet and conveniently pay for their purchases, without having to worry about carrying cash or cards. On the other hand, for CCD it means enabling access to over 15 million MobiKwik users, most of them youth, who prefer to use their mobile wallet for making all kinds of purchases. Why Mobile Wallets are Tapping Offline Market? Over last couple of years, mobile wallets have become a popular and easy way to make payments online. Payment through mobile wallets on various ecommerce sites has been growing at fierce pace thanks to attractive offers that mobile wallets bring to the table. While CCD is just the start, over next few years, we are sure to see many offline stores starting to accept these mobile wallets. The reason is simple, people do not want to carry cash, and making payments through mobile wallets is very easy. Your smartphone becomes your pay device. Also, you are able to track all your payments and purchases through mobile wallets, not to mention the attractive offers that mobile wallets give to their consumers. For Mobile Wallets, it is quite straightforward – Offline market opens up unlimited potential for growth! Who knows few years down the line, mobile wallet may just become your primary channel for making payments, atleast I hope it becomes!